Warwick Thornton entered cinema’s global attention in 2009 when his debut feature film, Samson and Delilah, won the Camera D’or prize at Cannes Film Festival, but his presence has been long felt in the Australian creative community in many capacities — as cinematographer for Rachel Perkins’ Radiance (1998), as a photographer and conceptual artist exhibiting at such spaces as ACMI and Stills Gallery, and now as a documentary-maker. 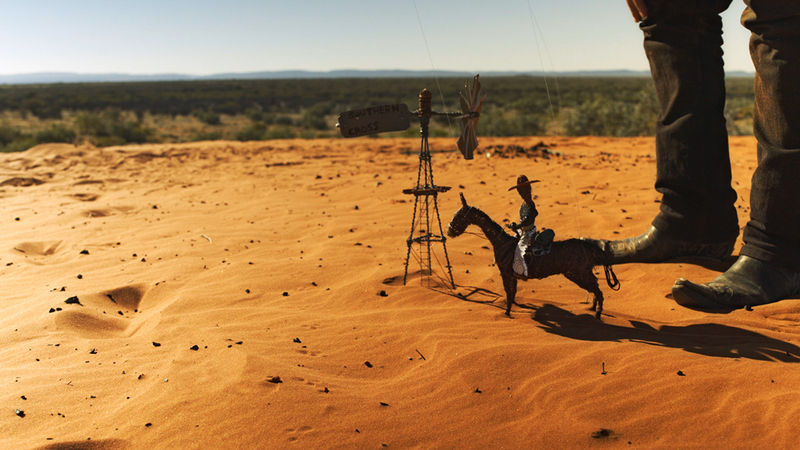 Earlier this year, Thornton’s We Don’t Need A Map was the bold choice for opening night at Sydney Film Festival (whose program dwelled heavily on issues of race) and this month broadcasts on NITV. The film takes the Southern Cross as its focus. Unbeknown to those who tattoo it on their shoulders and fly it on their flags as a symbol of nationalist pride, the constellation has its own myriad significances for Indigenous Australians, whose knowledge of astronomy is a form of mapping, ritual, storytelling and moral education, that exist as one with stories of country. Thornton takes us away from the city and into a number of Aboriginal nations, to hear elders tell their culture’s story of the great constellation, which turns out to be a crucial wellspring in creation lore. 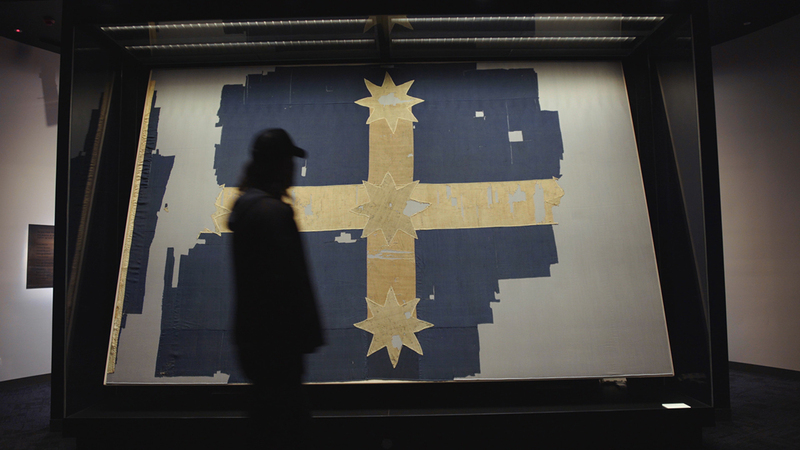 Along the way, we also hear from academics and artists, offering a 360-degree viewpoint on what the Southern Cross means when stripped of its exclusionary and muddle-headed political connotations. Press materials describe the film as a punk roadtrip doco, with irreverent sequences involving bushranger puppets and dioramas, but it has much broader implications: Australia has a problem relating to the past, as if history has only recently arrived young and free in this most ancient continent, and Thornton proves himself a forensic dissector of the myths, delusions and rhetoric that dominate the history wars from the Eureka Stockade to the Cronulla riots, to today. His vision is a long-sighted one, grounded in ancient protocol and law and faithful to fact and history in a way that both reveals and respects the secrecy of Indigenous, pre-industrial knowledge, while also showcasing the insights and wisdom of some remarkable non-indigenous Australians. LCH I learned heaps from this documentary. The image of the Southern Cross constellation reflected in the side mirror of a car door seemed to me to be a great visual symbol of the film’s approach. What’s your impression of the film? TY That reflected image idea is a big part of the knowledge Thornton is working with. In our cultures Skycamp in many ways is a reflection of the earth, with sites, stories and songlines in an “as above so below” kind of arrangement, stemming from the Turnaround event of creation that separated the material and spirit worlds into earth and sky. They reflect each other, overlapping at sacred sites and through the kind of ritual practice that is depicted in the film. An image of a person or entity is sacred because it holds the spirit of that thing — so the word for spirit and image is often the same in our languages. This is the reason we often avoid images and names of the deceased. It is the same reason the old men in the film erase the Southern Cross symbol following the ritual. LCH To me the doco spoke to how symbolism can be twisted and mutated. It made me realise that nationalist usage of the Southern Cross in contemporary Australia is the most grotesque form of cultural appropriation. What are your thoughts on this? TY As the old men said, that image is sacred and cannot be kept; it certainly cannot be marked on the body outside of ceremony. The people who adopted the Southern Cross image for flags and tattoos as a symbol of nationalism based on exclusion and privilege are really cursing themselves and their own people, from this perspective. But it is simplistic to frame this as a “white” thing, or Australian thing, and I think the film explores this in a more nuanced way. I was particularly struck by the switched-on Anglo people who were interviewed — their self-awareness and critical reflection are a credit to them and their community. No denial or defensiveness — their level of awareness and perception in critiquing their own culture is a great strength and does not diminish them — it makes them complete people. They are comfortable with discomfort and committed to truth as a way of life. They set a good example for others to follow. Duane Hamacher, for example, who is interviewed at a stone calendar site at the beginning of the film, has done exciting work in this field. LCH It is fascinating to learn more about Indigenous astronomy, which has an understanding of the negative spaces between stars. Thornton describes it as not just being about navigation, but interviews someone who says, “the night sky, for us, was the whole of philosophy.” As one of the elders says, “all these stars are connected to all these trees,” and all the stars are related, too, rather than being carved into discrete, lonely constellations. TY The idea of astronomy as a mere navigation tool is very industrial and utilitarian, and our star knowledge goes way beyond that. All the memories are up there in the stars — the night sky is a vast mnemonic device that is used to store terabytes of knowledge. These memory maps are used to navigate mind and memory over deep time, to hold ancestral knowledge so vast that it would be impossible to contain in print. This knowledge is also held in songlines all across the land, and in inner maps held in the mind, so they can be accessed without actually being in the place or even looking at the sky. This is our literature in oral cultures, and it was the same for everybody in the world until very recently in human history. You can see it in the early works of Western literature, like Homer’s epics, which were oral texts initially before being written down. This orientation to knowledge and memory results in a way of knowing that some people call “pattern thinking,” which modern science is now exploring through complexity theory and fractals; it allows us to see the whole as well as the parts and discern patterns in what some see as chaos, to make accurate predictions about weather systems and human behaviour. Some of us are even currently applying this Indigenous reasoning to economic trend analysis (and let me tell you, the outlook for the near future doesn’t look good!). LCH The film talks about how the Southern Cross connects land and sky stories. Is there any information embedded in the film that an audience member without deep Indigenous knowledge would miss? TY That information is present, but difficult to see through a Western lens, particularly a perspective based on binary oppositions — male/female, light/dark, land/water, heaven/earth. It is all about the connectedness and transformative overlap between things that some see as opposite, the vast songlines that connect freshwater to saltwater, Skycamp to earth, men to women. The inland stories are connected to coastal stories, and these are stories of transformation and transition. There is also lots of latent information embedded in the film about women’s business and men’s business. With the canoe ritual in the film we see the common overlap between the two — when the old lady is singing we glimpse the power of women’s knowledge and the old matriarchal authority, the edge of it where it overlaps in a common space that can be accessed by all the community. The rest is so secret and so powerful — you’ll notice the women do not share with Thornton beyond this. The power and agency of women in our culture is seldom acknowledged in the mainstream — the Western lens frames us as patriarchal and abusive when it comes to gender relations. That’s the binary thinking again. LCH I don’t think that mainstream Australia really understands that Indigenous custodianship and care extends from the land through the air to the sky — that’s the extent of colonialism’s theft, too. Do you think We Don’t Need a Map conveys the expanse of Indigenous ecology and thinking, this sense of a galactic robbery? TY This is not just Indigenous knowledge, but human knowledge that all people had until recently. Industrialised and colonial thought is imposed and kept in place through a kind of cultural brainwashing, disconnecting people from what they really are. It is not as simple as black and white — it is about industrial and non-industrial reasoning. Scratch the surface and you’ll find that all around the world people all call the Seven Sisters constellation the same thing, with a similar story. Orion is always a hunter or warrior. Castor and Pollux are always two brothers. Aquila is always an eagle. All people globally are connected to these songlines in the earth and sky, and have only recently had their knowledge and communities fragmented. Most people in the world are dispossessed from not only their ancestral lands, but also their ancestral thought. All this disconnection and diaspora serves the interests of only a few people in this temporary experiment of industrial civilisation. The good news is, it is only a blip in the vast human story, and will not last. Who knows, maybe your grandkids and mine will one day be sitting under the stars and seeing the same story together again. LCH At one point, one of the elders greets the black night by saying, “Hey, night.” That’s a pretty unusual thing to hear in film: the treatment or characterisation of an environmental concept as a person or a being. I think that kind of sentience has mostly been seen in science fiction films: I’m thinking of the Russian classic Solaris, followed by Steven Soderbergh’s remake, in which the ocean has a consciousness. TY Science fiction has a solid tradition of exploring the sentience of complex, self-organising systems. In literature, China Mieville probably does it best, although his books have not been made into films yet. It only occurs in fiction because the Western academic requirement of objectivity is a barrier to understanding our true relationship with the sentient universe. This academic view is placeless and seeks a mechanistic and broadly generalisable explanation of all phenomena, while the observer must pretend she or he does not exist while reporting it. The place where the observer stands, the standpoint within a dynamic landscape, must also be invisible. Indigenous knowledge is seen as subjective by the Western academy, but from our viewpoint the cosmos is communicating with us, so the things we see from our personal perspective grounded in our location are part of the story. So in the film you see that old lady singing the star story and including everything that happens in that moment in the song — clouds passing across the sky, birds flying, fish jumping…this is all part of that story of Skycamp and its communication with us in the moment. LCH There are parts of the film that betrayed its television production origins: I found that the emotional tone and generic registers were not well sustained, and the digressions into rap, punk road trips and bush puppet reenactments were distracting. I think it would have been stronger and more sustained if it was a pure essay film, as the PR material described it. But I really loved the connection between talking heads in the bush, and Professor Ghassan Hage, who talks about how the Southern Cross is embedded in wider discourses of racism and fear that “have made refugees into exterminable objects” and of a “culture of exterminability” whereby we refer to inanimate, sinkable “boats” instead of people. TY That discourse of exterminability is made possible by the false objectivity I mentioned previously, rendering the observer/speaker unaccountable and as invisible as the victims of their discourse. This is why the academy has historically de-emphasised subjective, supra-rational, diverse and place-based ways of thinking. I think the film does well in privileging these kinds of seemingly irrational and disjointed worldviews. It draws on a punk aesthetic to reflect this in the domain of contemporary film, and as you mentioned earlier it is an act of culture jamming. I don’t see this work as inconsistent; the film is characterised by constant and deliberate code-switching, not just between dialects and social registers but between genres as well. At times this is jarring but it is supposed to be. Warwick Thornton achieves this code-switching effect masterfully, and with a genius and humility that makes him my new favourite filmmaker. And he is never the invisible observer — we often see him in shot while he himself is filming another angle. This visibility makes him accountable for the knowledge he portrays and speaks to his cultural integrity. LCH Yes — the way that Thornton casts himself as the filmmaker and central character, guiding us through the film, as well as the self-reflexive shots of him beside his cameraperson, is really important in showing that he’s a fallible human. He’s absolutely not playing the role of documentary’s traditional and supposedly objective, onscreen authority figure, like Michael Moore. How did you think the old stories told by elders related to the Western film techniques of talking heads and time-lapse photography? Do you think there’s such a thing as an Indigenous cinematic language? TY Diversity is one of the few things that Indigenous cultures and languages have in common. As such, there isn’t really a single Indigenous anything, let alone a common cinematic language. Thornton incorporated the same kind of talking heads you see in docos like SBS’s series First Australians, but with the old people out bush in cultural contexts he did something quite new. He brought the viewer into the yarn, sitting alongside the knowledge keepers, and he wove the protocols of Indigenous knowledge transmission into these intimate episodes — something that is glaringly absent in the talking heads sequences filmed in the city. It forces the viewer constantly in and out of a sense of connectedness, so that we experience a sense of loss and separation over and over, instilling a cultural desire for authentic connection that endures long after the film is over. LCH Another interviewee in the film, Dr Romaine Moreton, says, “I don’t think identity is contained in symbolism.” To me the film spoke to the limits and power of symbolism in personal, community and national identity. What did you think of her take on the relationship between identity and symbolism? TY The transient cultures of industrial civilisation must constantly be shifting the meanings of symbols and memes to suit the shifting goals of ‘progress,’ which are dictated not by cultural needs but by the requirements of continual economic growth and resource extraction. Identity, meaning, movements and metaphors emerging organically from the demotic in human cultures are constantly co-opted and absorbed, then twisted to suit the needs of the powerful. Note for example the shift in the last 30 years in the meaning of symbols and metaphors pertaining to the idea of freedom. Freedom no longer means escape from tyranny, but the right of business interests to act without accountability for damage done to systems, land and communities. In Indigenous cultures, the symbols and stories that make up our identities endure in our Law, retaining their integrity of meaning over deep time. Our wealth is knowledge, not money and resources. Power for us is about accepting accountability for protecting sacred knowledge. 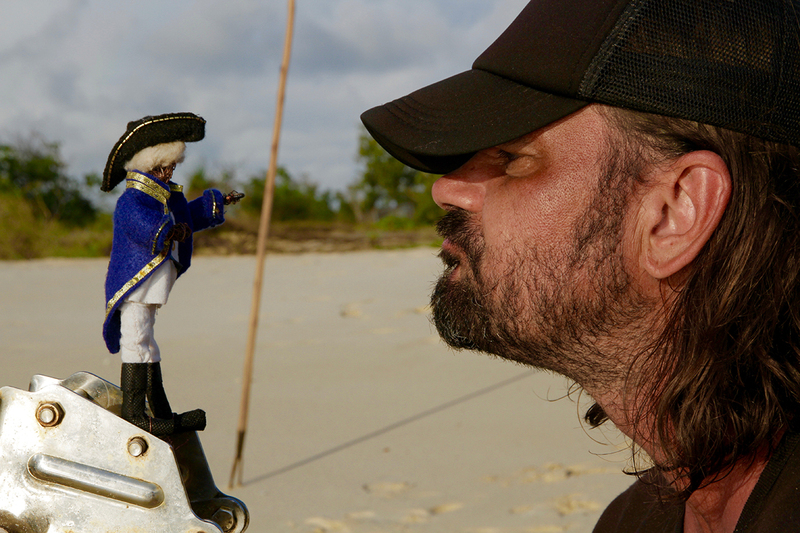 Warwick Thornton honours his accountability to the knowledge that is shared with him in this film, and demands that his audience does the same.